In Voodoo the goal is to move your score marker along the number track. Players earn points by casting curses on other players. A typical turn consists of a player rolling the five ingredient dice. Players may re-roll as many times as they want, but they must remove another die every time. Players can put some dice aside for their “ingredient bag” but must always discard a die in order to roll the remaining dice again. After a player rolls, they may discard two dice to draw a curse card or artifact card, use an artifact card (no cost), or cast a curse using the appropriate ingredients on the dice. Players can do multiple actions in a turn if they have the resources to do so. Artifacts are single-use cards that perform various functions like blocking a curse, duplicating a curse and targeting someone else, changing the target of a curse, and other things. Curses are where the mechanics of Voodoo really come into play. 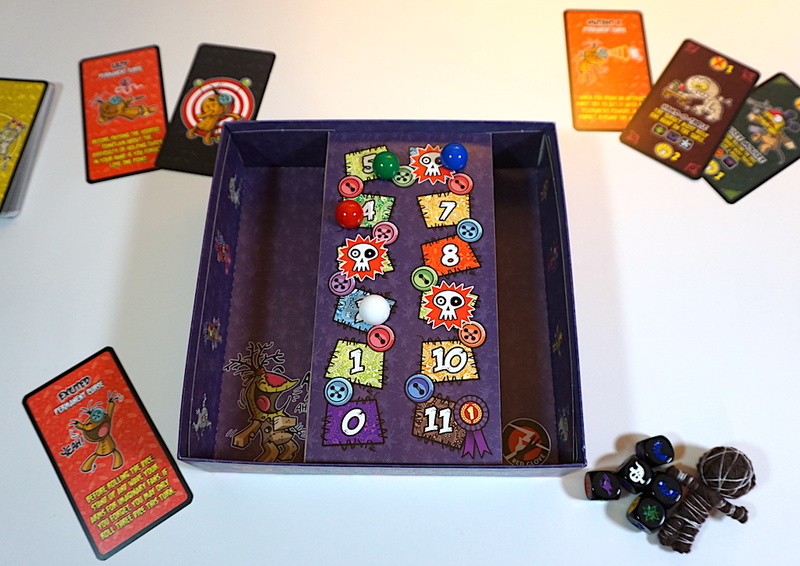 Players cast curse cards by discarding (spending) the appropriate dice, declaring the target player, and reading its effect out loud. They then get the number of points on the bottom of the curse card. 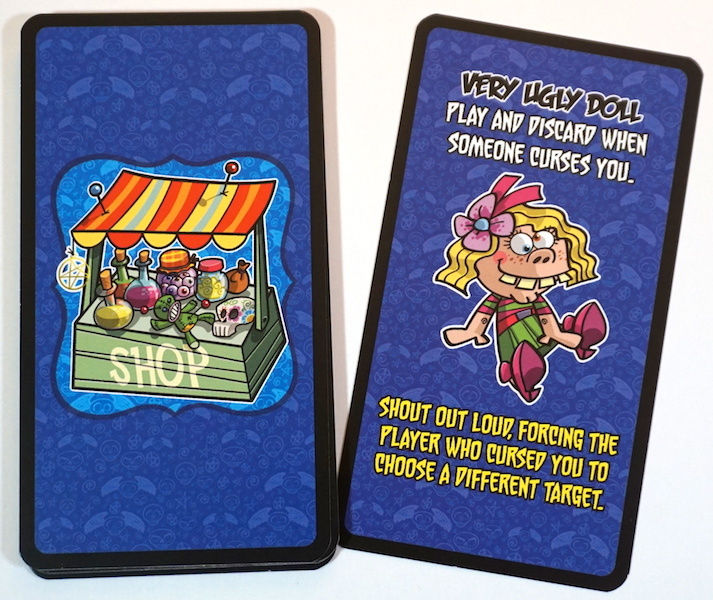 The receiving player is now “cursed” and must do whatever the card says until the end of the game. Curses in Voodoo aren’t the end of the world. My children especially liked the curse”Da Gentlemanz” which required the target to talk like an aristocrat for the rest of the game. There are many different kinds of curses that range from dexterity curses (“Leg-o-sky” – The target can’t touch feet to the floor) to silly actions (“Avada Cradabra” – Before rolling the dice, the target must croak like a frog). The curse is “interrupted” when the target of a curse fails to fulfill what it requires. (Players can do this accidentally or on purpose). The player who cast the curse then gains the points on the *top* of the card and it is discarded. 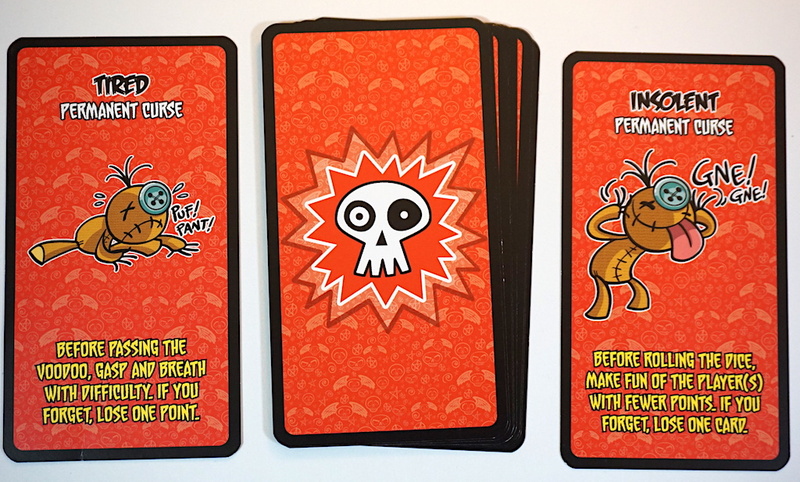 Finally, there are three spots on the scoring board (point 3, point 6, point 9) where players must draw Permanent Curse cards from the Permanent Curse deck and they are afflicted by these curses. Each of these curses has penalties for forgetting directly on the card (you lose a point, everyone else gets a point, etc). The first player to 11 points wins! 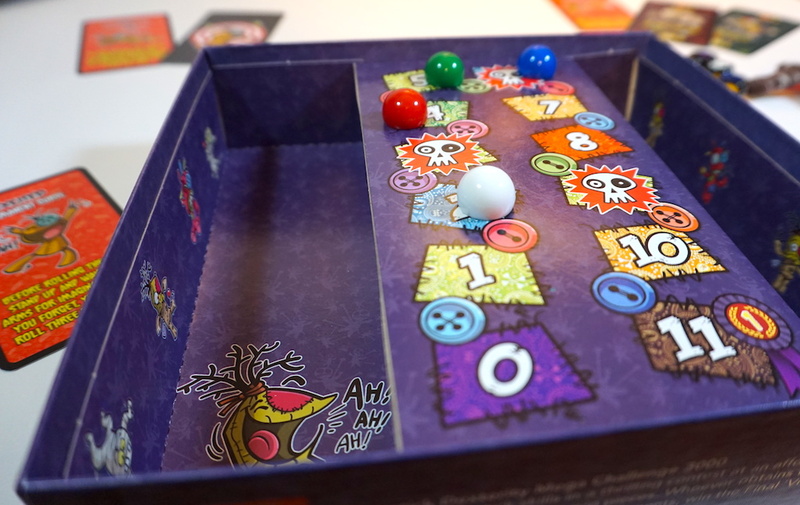 Voodoo is a simple game with straightforward mechanics. It ranges from 3 to 6 players with more people better than fewer. 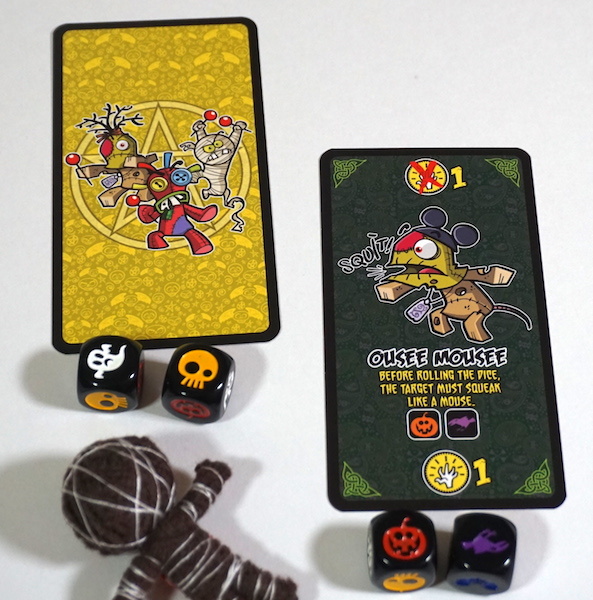 Voodoo also fills the need for more games with Halloween or spooky themes that aren’t actually scary. It’s absolutely a game that doesn’t take itself too seriously. Every game of Voodoo we played resulted in numerous bouts of laughter. Voodoo is definitely a game for kids. The humor is juvenile and will definitely wear on the more refined gamer. The randomness of rolling dice for ingredients was frustrating at times. All I would need is a certain ingredient and it would never come up. I would simply get stuck with no chance to move forward due to poor rolling luck. Any kind of persistent ingredient bag could have helped with this. Ultimately, Voodoo proved too shallow for me to sink my teeth into. I need some kind of cerebral engagement when I play even casual games, and it just wasn’t there with this one. My kids absolutely love it, though, so its appeal to the more fun-loving demographic cannot be denied. Of course, if you are uncomfortable with the idea of magic or Voodoo this game isn’t one to pick up. But if you’re looking for a casual filler with little-to-no preparation needed, Voodoo fits the bill. You can pick it up on Amazon for just over $20. 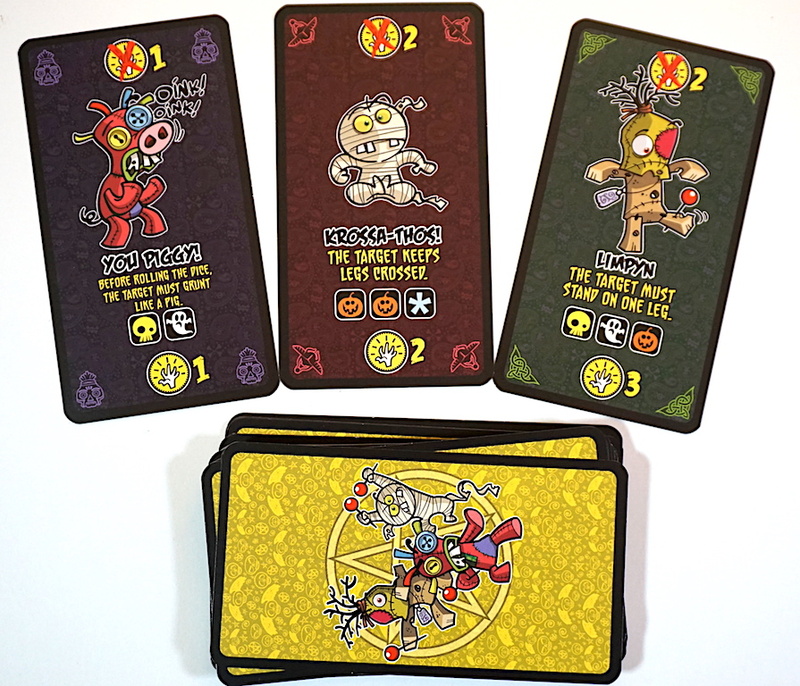 The Family Gamers were provided a review copy of Voodoo by Mayday Games for this review.